Around the world there are many diamonds that have been talked about or written about in various stories and official documents. Famous diamonds are part of our world's history and have been found in various parts of the world by all types of people. From royalty to the gods, famous diamonds are often as well known as the people who owned them. 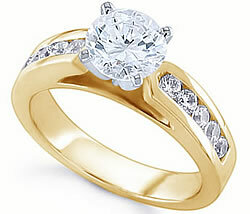 One of the few oval shaped famous diamonds, the “mountain of light,” was first mentioned in the year 1304. It weighed an astounding 186 carats and it is said that the diamond was set in the peacock throne of Shah Jehan as an eye of one of the peacocks. During Queen Victoria's reign, the shape of this famous diamond was altered a bit and it was recut to weigh 108.93 carats. The diamond is currently one of the British Crown Jewels. A story about the Orloff claims that the diamond was actually placed in the eye of a god, in the temple of Sri Rangen, which is how it became known as one of the world's famous diamonds. When the French Revolution ended, “The Regent” was owned by Napoleon Bonaparte, and was placed into the hilt of Bonaparte's sword. Sometime during the French Revolution, the Blue Hope diamond was stolen. It was later found in London in the year 1830, where it was later purchased by Henry Philip Hope. The blue hope diamond received it's name from this individual, as well as it's reputation for causing bad luck to those who owned it. While Henry Philip Hope owned the precious blue diamond, each of his family members died in extreme poverty. Continuing with the bad luck, a later owner of the Blue Hope, Mr. Edward McLean also lost many family members to poverty while he possessed this famous diamond.